I have to admit that I have a bit of a soft spot for big pocket watches. Most collectors favor the size 16 watches like the 992 or 992B. That's easy to understand, they are beautiful railroad approved grades. But there is something special to the even larger 18 size models. They are substantial, palm filling watches and they harken back to a time of steam engines and Victorian houses. There are a number of 18 size grades and they came in even numbered open faced configurations or odd numbered hunter cased siblings. Open faced models have the second hand opposite the pendant at the 6 position. Hunter cased models have the pendant at the 3 position. If a hunter cased movement is installed in an open faced case, it is sometimes called "side winder" as a result. The most basic grade of 18 size models was the 924 and it's counterpart, the 925. The 924 is the open faced version and it has 17 jewels with a nickel plated full plate back. The regulator for the Breguet hairspring has a micro-regulator adjustment. The 924 was introduced in 1899 and produced through 1923 - that's quite a production run for a movement. I recently landed a 924 project watch and it captured by interest because I really the like Hamilton Watch Co branding on the enamel dial. As received, the watch was in good overall shape and in running condition. There are a couple of minor scratches on the glass crystal but nothing enough to justify replacement. Flipping it over, the case back shows a bit of wear through to the brass. This watch predates the term "gold fill" and instead it has a 25 year warranty. Well, I guess after 111 years the warranty has expired by now. 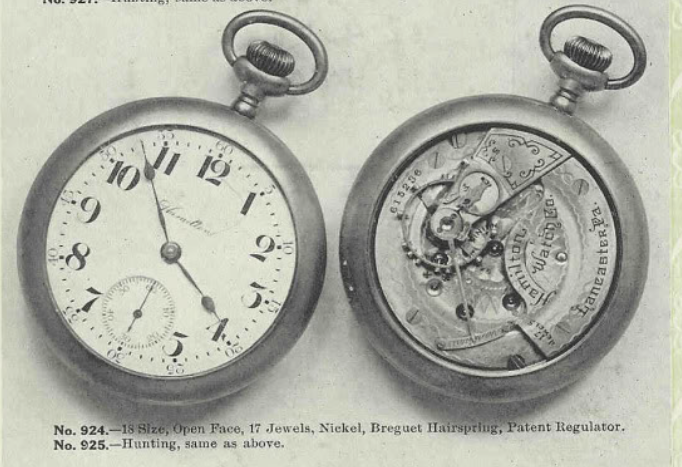 Watch cases often had 10, 20, or 25 year warranties and that indicated how much of a gold layer the case had. Solid gold cases wouldn't need a warranty - so if you see a warranty inside the case, it's a good sign that it's not solid gold - even if it appears to be. This view of the movement looks exactly like the catalog depiction. Early 18 size movements often didn't have the grade stamped on them, so this barrel bridge doesn't say 924 anywhere. You'd have to identify the grade by looking up the serial number, although you know it is a 17 jewel movement. This movement is lever-set so you have to remove the bezel and then slide the lever out at 2 to put the movement in the setting position. Now when you turn the crown the hands will move. Sliding the lever back in will put the watch in winding position. Once you remove the two case screws from the back of the movement, the movement will slip out the front. You need to be extra careful with this style of balance, as it's very exposed when it's not in the case. The movement has a dust ring spanning the gap between the main plate and the back plate. There's a little slot to enable you to pry it off. Without the dust ring you can see the train wheels tucked between the two plates. Three screws secure the three dial feet and with the dial carefully lifted off you can see the parts under the dial that allow you to set the time. The click is on the front of the movement and keeps the mainspring from unwinding. To receive the mainspring you can just slide the click away from the wheel. It's best to do that with the movement back in the case so you can hold the crown and slowly let the mainspring down. Two screws hold the barrel bridge down and with the bridge out of the way you can see the mainspring barrel. The other side of the barrel has the winding wheel with a D-shaped hole so that it will engage the barrel arbor. Two remaining screws hold the back plate / train bridge on and once they are out of the way the train bridge can be lifted off to reveal all of the train wheels and the pallet fork. Opening up the barrel, the mainspring looks clean and in good condition. I'll put it anyway, just to check if it's set or not. These 18 size springs pack quite a wallop so you need to be careful with them when they are coiled up. As suspected, the mainspring has set and lost a lot of it's potential energy as a result. So I'll replace it with a fresh spring. Most of these 18 size movements use a No. 15 spring. Here's a perspective of what a fresh spring looks like relative to a set spring. There's quite a difference between the two and a fresh spring actually coils a little in the opposite direction. All of the parts are cleaned and dried. There are basically the same number of parts in a pocket watch as there are in a wrist watch - but they are much larger. I'll use my big kahuna mainspring winder, the K&D 128. You need a substantial winder to install these large mainsprings. There's no way you could do it without a winder. This style of winder is a pain to use, relative to the smaller winder I typically use. There are several different sized heads and you pick the head that is closest to the barrel size but still leaves room for the spring to be installed. The head hold the spring until you push it out of the head and into the barrel. It took about 5 attempts but I finally got the spring installed with the T-end in the hole of the barrel. I even jammed a screwdriver into my thumb while doing so. In any other watch this would be called a success but then I realized the spring goes the other direction in this watch - so I had to take it out and do it all over again. Okay - after several more attempts I finally got the new mainspring installed and it's coiled in the right direction. Now I can put the arbor in and a little extra mainspring grease before I close it up with the cover. Getting the train bridge back on is an exercise requiring great patience, as you need to line up five pivots... four wheels and the pallet fork. It's very tricky and requires a gentle touch. Then the barrel can go back in. I need to put the parts back on the front in order to wind the watch a little. Then I can install the balance. All the parts are installed on the front. I'll reinstall the dial to keep everything in place. The balance is back in place and the watch has been brought back to life. An 18 size movement is too big for my main movement holder so holding the movement is a challenge. It's almost too big for my watch timer too but the timer just barely accommodates it. The beat error is on the high side of acceptable. I could probably lower it but adjusting it risks goofing up the hairspring. So I'm okay with a beat error of 3ms. A little tweak to the regulator brings the beat rate up just s smidgen north of 18,000 beats per hour. I'll leave it here and check it after the watch has an opportunity to settle in. Putting the movement back in the case isn't too difficult and it offers a bit of relief to know that the balance assembly is protected again by the rear cover. This case cleaned up really nicely and the enamel dial has only a couple of faint hairline cracks - even my merciless camera can't identify them. The movement is noticeably brighter now that it's cleaned. Notice how yellow the jewel settings are. A recently serviced watch will have bright jewel chatons so if you see a "recently serviced" watch with greenish dull settings you know the seller isn't being entirely truthful. It might have fresh oil but it wasn't cleaned. That's like putting on deodorant instead of taking a shower... you may smell clean but you're not clean. A little polishing goes a long way toward brightening the worn through area of the case back. You can't even tell this watch has wear to it but it will eventually come back. Very nicely presented and illustrated. I appreciate your careful step-by-step as well as the side comments such as green vs. yellow after cleaning. Good question... I'm not really sure but I suspect the timer just hadn't calculated it yet. There's only about 10 seconds worth of ticking displayed on each photo. I will usually watch it for a minute or so but I take the picture almost right away so I can get "back to business". I'm sure it came up eventually because the timing trace is very clean otherwise and it already has the beat error.